This page is about the premium/pack AMX-30. For other uses, see AMX-30 (Family). 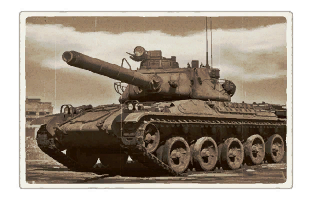 The AMX-30 is a gift Rank V French medium tank with a battle rating of 7.7 (AB/RB/SB). It was introduced in Update 1.77 "Advancing Storm". The armour only reaches 190 mm at some angled parts of the front, the turret goes 100mm at best, some rank I vehicles like the Panzer IV E could take you on frontally and easily win. Be wary, also, of your ridiculously tall cupola, you can be destroyed even if you are behind cover just because of it. The mobility, which is good but unexceptional, can be both a blessing and a curse, since, due to said lack of stabilizer, you will not be able to shoot accurately while on the move. The AMX-30 is a similar tank to its younger counterpart, the AMX-30 (1972), with the 20 mm coaxial autocannon replaced by a 12.7 mm heavy machinegun, still able to deal with lightly armoured targets such as SPAA, but doesn't deal the extra punch of an autocannon. 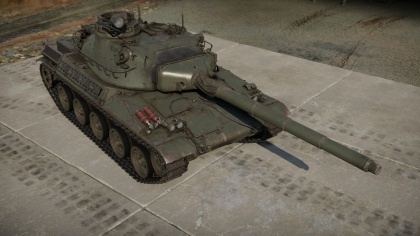 Like the AMX-30 (1972), it lacks a stabilizer and has incredibly weak side armour, but the excellent HEAT shell, comparable to other nations' HEATFS shells, the reasonable front armour (most tanks will still one-shot you though) and the good mobility make up for it. The HEAT shell is comparable to other nations' HEATFS shells, and has a good penetration amount (400 mm flat), but will often bounce on angled surfaces. When the shell penetrates, it usually causes enough shrapnel to one-shot a tank. In a fight against lightly armoured vehicles, like SPAA, the HEAT round will often cause hull breaks. Ammo racks of the AMX-30. This tank cannot stand a fight on its own, therefore, only two tactics are viable. First (the most dangerous), you can try getting behind the enemy lines and attacking the SPAA, you will often get hull breaks thanks to the HEAT round, be wary of bushes however, they will stop your HEAT shells, you can attempt to take on enemy tanks, provided it is from the side, and you can hit the ammunition (HEAT will rarely cause fire, and the weak shrapnel makes it hard to take out entire crews). 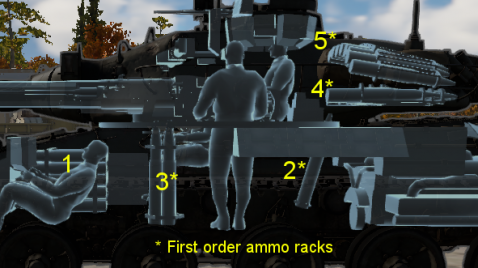 Second, stay with your team, ideally behind another tank (do not lead the formation, it'll paint a target onto the tank), use your HEAT shells to disable tracks or take out one or two crew members and ease the task of your teammates. Compared to the vehicles it will face, the AMX-30 ranges from Inferior to Harmless, every enemy vehicle should be regarded the same way, as major threats that will destroy it in a couple of hits at best. Aiming for the ammunition is the only way for you. HEAT shell will be stopped by any kind of obstacle, which includes (but is not limited to) bushes, trees, fences, wooden houses, etc. This page was last edited on 31 March 2019, at 16:43.